Publisher: Telltale Games, Warner Bros. The time has come for the newest episode of The Wolf Among Us to drop and Telltale Games has done a fantastic job of keeping the story rolling fairly quickly after the first initial delay between Episodes 1 and 2. With this fast pace of release Telltale has been able to keep up the quality of the episodes, though some tended to be on the shorter side. Episode 3 had definitely kept up the quality, along with having much more diversity of choice, but it’s time to see if Episode 4 is able to stack up against the high benchmark or start slipping as the story draws closer to its conclusion in the next episode. The end of Episode 3 left Bigby Wolf in a bad way, after finally finding out who was behind the murders and learning he isn’t the most feared of all the Fables. With all that said and done, Bigby is pretty hurt and Snow is now in charge, but luckily, it’s nice to see that Bigby isn’t one to lick his wounds, sticking to his guns and trying to complete the investigation by bringing in the one responsible. The major story dynamic at the beginning is how previous actions with Snow and current reactions paint their relationship, as is it clear to see the nature of their feelings finally start to eke into view. Of course it is still up to the player as to how this impacts everything else, what with Snow in charge and wanting everything by the book, where Bigby only ever wants what is right. 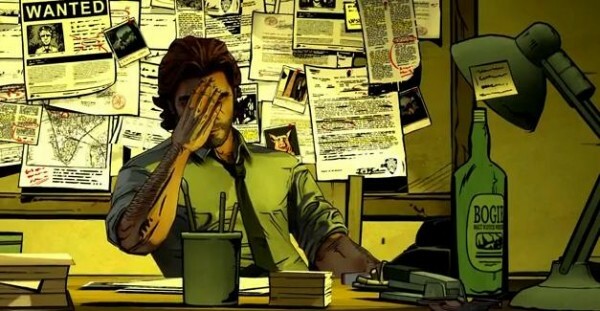 When it comes back to getting on with the investigation, Bigby has to focus on how ti find the ones responsible when they do such a good job never connecting themselves to anything directly. Just finding a place to start looking involves re-talking to characters from previous episodes just to get a nudge in the right direction. Though other players get that nudge, through camaraderie or superiority is still left up to the player. In truth parts of this episode go by fairly quickly, with many of the scenes centered around conversation again instead of exploration. In fact there is only really two locations with an interesting amount of things to look at, unfortunately that option is dependent on where the player chooses to start their investigation, which is a little disappointing, as it makes the investigation more conversational than gathering actual clues. While the last episode had Bigby wolf out more than ever before, Bigby does not go nearly as far this time when it comes down to the fight in this episode. But, it seems that Telltale knew this and made up for it by having the fight be against one of the most interesting monsters so far in the game. This does do a little to make up for the fact that Bigby doesn’t go all wolf form on him, but not doing so does a good job reminding people just how powerful Bigby is even without going over the edge. Though with this all in mind it will be great to see where they can take the fights from here to the final episode. When Bigby does finally know where to find the perpetrator, he takes no time in heading straight there to confront the one responsible for pretty much everything that has gone down so far in the series. 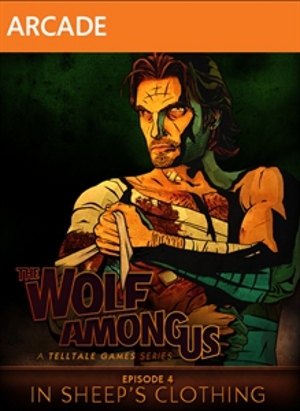 But, it wouldn’t be much of a story if ended just like that and much like it’s predecessor The Walking Dead, The Wolf Among Us finds just the right stride to slowly build up the anticipation for coming face to face with the big bad. It’s also nice to see that they still know how to make a good ending point to pick up from in the final episode, but still suffering from being on the shorter end of the length side of things. 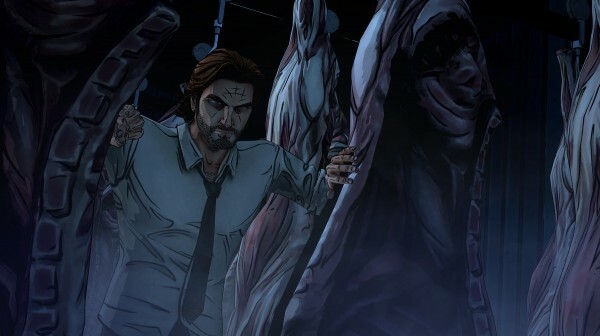 Not much of anything has changed since the last episode in terms of gameplay, but in this episode, as was mentioned previously, there was a lot less focus on exploration and much more on the conversations that Bigby had to have. There are only a hand full of scenes where Bigby can look at different objects in a scene, but only two of these has anything of significance to look at, while the others offer only a tiny bit of something more to due while waiting for other characters. It’s such a small thing, but it adds so much to players feeling in charge of how they are playing the game. Here with exploration so limited it feels too much like the player isn’t the driving force of the game, but simply coming along and picking options on the way, which can feel disappointing. One of the strongest point of The Walking Dead was taking your own time in exploring, punctuated with moments of fast paced survival. 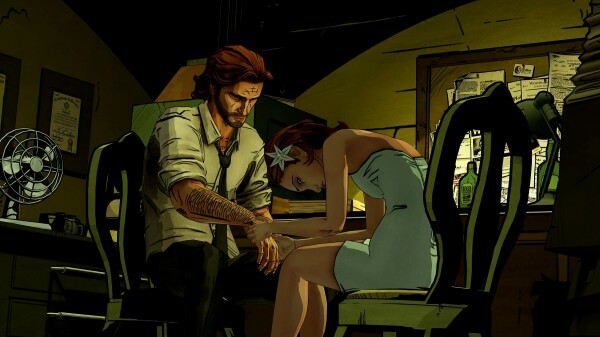 The Wolf Among Us on the other hand almost every aspect gives a sense of rushing, which is alright in terms of wanting to solve the crime, but it should feel more like time passing with every choice the Player makes instead of forcing players to make a choice to keep things moving. This episode has a few new scenes and characters to see, but for the most part it’s Bigby revisiting with old characters. The look of the new characters goes further than those of previous episodes though, from the Jersey Devil, to Tiny Tim, to the big bad, the quality is still able to meet the standards of the past episodes. With such a focus on the conversations that Bigby is having with so many characters it’s great that so much is done in terms of the quality of the voice acting and writing for the dialogue. 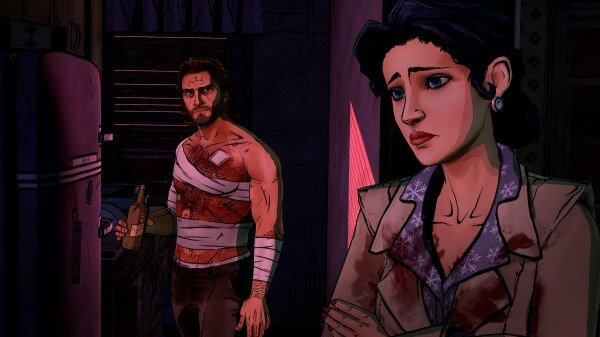 Again this time around The Wolf Among Us suffers from having a fairly short length, but is still able to keep up the quality that it always has in the past. Unfortunately, Episode 4 also offers a lot less to look at in its scenes and this big focus on conversation over exploration, especially with the shortage of decisions the player can make during the episode than in previous ones as well. However, this is still the same quality visuals, audio, and story, plus with it being the second to the last episode it can be easier to forgive as it really serves as a means of finding out as much as one can about the bad guy Bigby has been after all along.